Gabe Miller (3) returns the opening kickoff 59 yards to set up OWU’s first score of a 49-7 win over Kenyon in NCAC play Saturday at Selby Stadium. 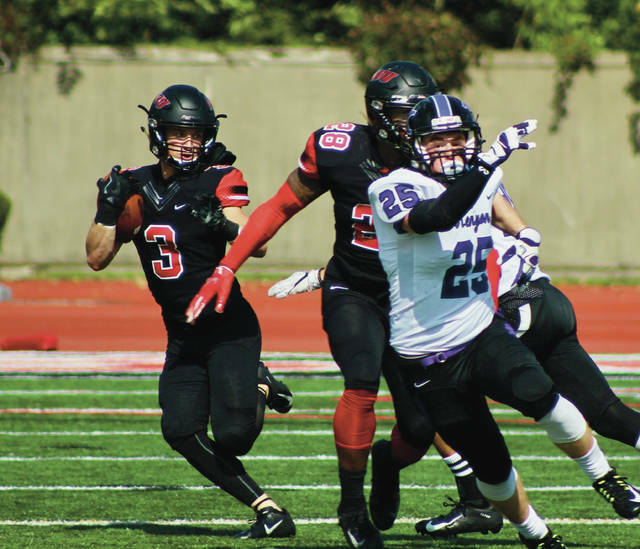 After a rough two-week stretch that saw back-to-back losses on the road, the Ohio Wesleyan football team had a players-only meeting Monday. The Battling Bishops responded with a 28-point onslaught in the first quarter on their way to a lopsided 49-7 victory over Kenyon in North Coast Athletic Conference play Saturday afternoon at Selby Stadium in Delaware. OWU did it on the strength of six forced turnovers and three touchdowns by its defense and Deji Adebiyi’s three scoring receptions on offense. Kor’Darius Melton had an 8-yard scoop-and-score and followed with a 27-yard pick-six on the next possession to turn a two-touchdown advantage into a 28-0 lead with 4:31 left in the opening frame. Natrone Barnes returned an interception 41 yards for a score in the second quarter as well. “When you score that many points on the defensive side – it’s demoralizing for any offense,” Watts said. OWU came out swinging with Gabe Miller returning the opening kickoff 59 yards to Kenyon’s 35. Martin Sesma had runs of 13 and 10 to set up his 1-yard touchdown to give the Bishops a 7-0 lead with 11:38 left in the first. Sterling O’Hara got the turnover party started by stepping in front of a Thomas Merkle pass near midfield. Jax Harville found Adebiyi on the left for a 6-yard touchdown six plays later and it was 14-0. The Lords finally got going late in the frame. Merkle found Ian Robertson on a fly-route down the right sideline for a 28-yard scoring toss to cut the deficit to 28-7 with 1:18 left. The score capped a nine-play, 75-yard drive for Kenyon. Adebiyi scored on a screen pass from 7 yards out with 1:20 left before halftime to give the Bishops a 42-7 lead at the break and he added a 5-yard score in third to smooth out the scoring. Harville completed 15 of his 26 passes for 156 yards and three scores and Sesma had 99 yards on the ground as the Bishops ran for a season-high 139 yards as a team in a year that’s been tough-going on the ground. Adebiyi had five catches for 42 yards and Miller had 48 yards on three snags to lead the receivers. O’Hara led with seven tackles and a pair of pass break-ups and Barnes had five tackles, including two for-loss to lead the Bishops (2-3, 2-2) on defense. Merkle went 28-for-41 for 237 yards, a touchdown and three picks with Robertson being his main target with 10 catches for 142 yards for the Lords (0-5, 0-4). Next up, OWU continues NCAC play against Wabash in Delaware. Kickoff is scheduled Saturday at 1 p.m.